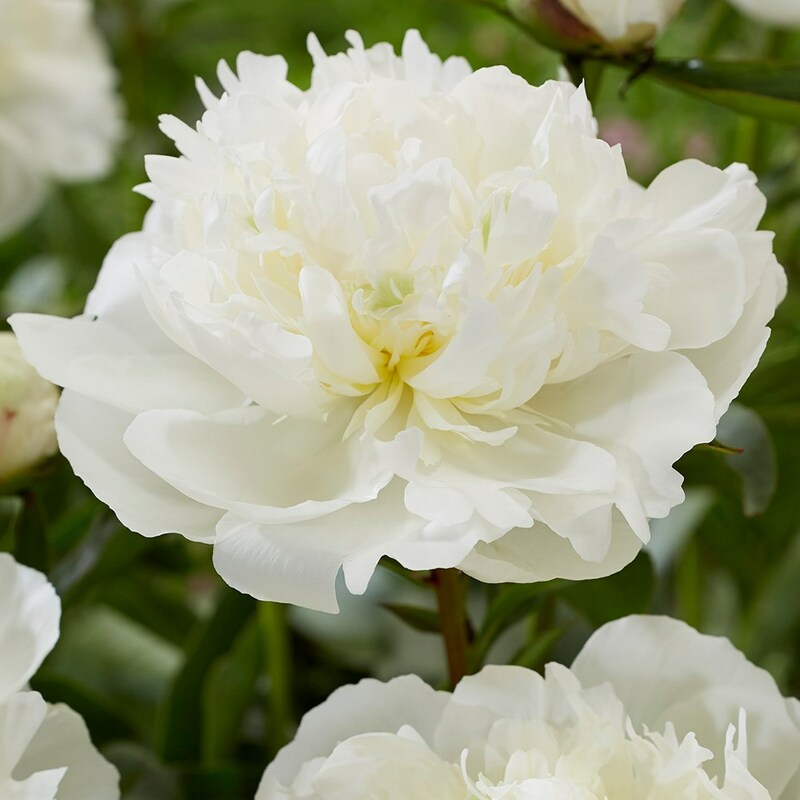 Prized for their blowsy, glamorous blooms and glossy, deeply cut foliage, peonies are held in deep affection by many gardeners, despite their short flowering season and vulnerability to peony wilt in damp weather. It's easy to see why. From the promise of early spring, when their red, mottled shoots push through bare earth and the handsome foliage unfurls from spherical red buds, to early summer, when the huge flowers burst open, peonies exert a fascination that few can resist. 'Duchesse de Nemours' has huge, bowl-shaped pure white, fragrant, double flowers, flushed green in bud, from early to midsummer. 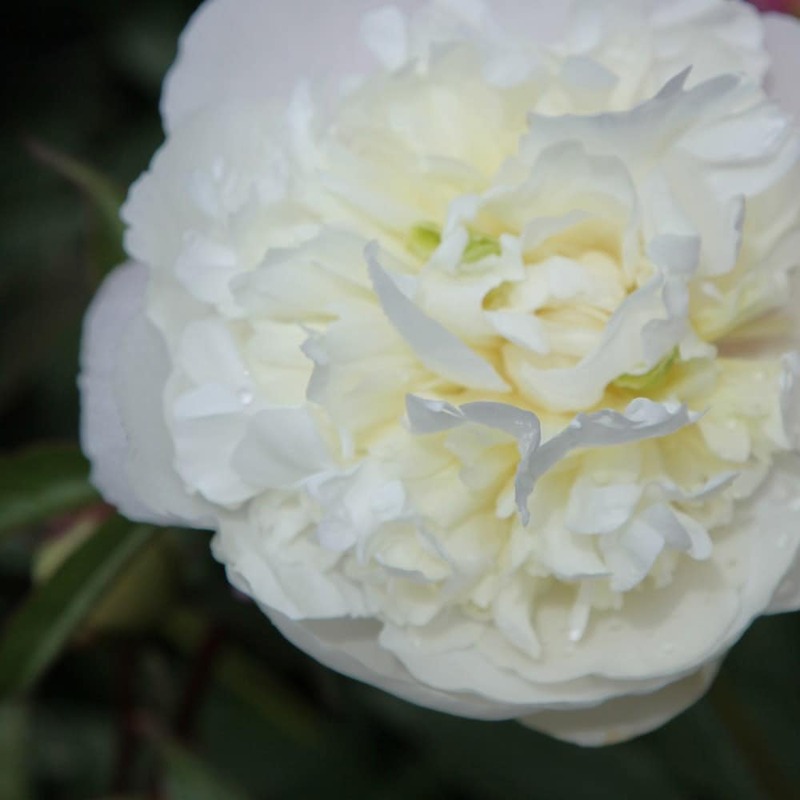 This classic, double-flowered peony from the mid nineteenth century is a favourite of the cut-flower trade. It will thrive in full sun or partial shade. Fill the bare ground around the peony before the leaves appear with spring bulbs to prolong the season of interest. Garden care: Deadhead after flowering. In early spring apply a top dressing of a balanced slow release fertiliser around the base of the plant and mulch with well-rotted compost or manure. If the plant shows signs of collapse or the leaves become spotty, this may be a symptom of peony botrytis. Remove affected leaves immediately. In the autumn, cut off all the foliage and dispose of it to prevent reinfection the following spring. The summer of 2018 was not kind to plants but I got 2 lovely blooms and hope for more (and less heat) in 2019. As yet I cannot rate it as it has hardly had time to settle in,I bought in in April although it did have one or two flowers. Hello, You could plant it a little deeper, but I would be careful not to go too deep as this is usually the reason that they stop flowering. Hello there You can move an established herbaceous peony in the autumn but it can take it a couple of years to settle in. Hope this helps. Hello, I purchased my Peony from you a few weeks ago and duly planted it in the ground as per your instructions. Everything seemed to be going well but unfortunately we have had some very strong winds today and I have come home to find the stems of my plant all broken at the base. It was tied to a stick to support it but apparently this was not enough. Should I have done something different with the planting to support it in case of wind? I want to buy another one to replace it but want to make sure i'm doing the right thing so that the same thing doesn't happen again. Hello, It must have been an exceptionally strong wind for this plant to have snapped like this to have snapped like this - particularly as it was securely fastened to a stake. I don' think you have done anything wrong, but I wonder if the plant has not been damaged by something else - ie. a cat, a fox, a football etc.